Garbage disposals are a great way to eliminate food waste, but when they start to malfunction, it can be a mess and smelly situation. 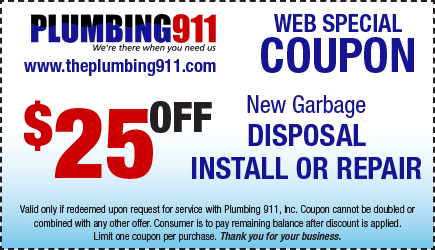 At Plumbing 911 our plumbing experts are here to take care of Garbage Disposals no matter what the problem may be. From installation or replacement to repairs and troubleshooting, you can count on us to take care of your garbage disposal. Whether your current garbage disposal unit is not cooperating or you think you’d like to have a garbage disposal installed under your kitchen sink for easy clean-up after meals, Plumbing 911 is the Cuyahoga, Medina, Summit, Portage, Stark, Lake and Geauga Plumber you can rely on to take care of all your kitchen garbage disposal needs. Our technicians have the training, knowledge and tools to ensure garbage disposals are installed and operating correctly, saving our customers from future problems with their investment. Foul odors, compactors that won’t work, mishaps in installation – we’ve seen it all, and we know how to fix it. Put your trust in our expertise, and remember: your satisfaction is guaranteed with Plumbing 911.